Algeria’s main Islamist opposition party Wednesday said incumbent President proposed by the ruling coalition to run for April Presidential elections for a fifth term in office will not be able to fulfil his duties due to his health condition. Movement for the Society of Peace (MSP) castigated the ruling coalition that it said has taken Abdelaziz Bouteflika hostage. The 81-year leader, in power since 1999, was chosen by the ruling coalition to run for April 18 elections, for a fifth term. 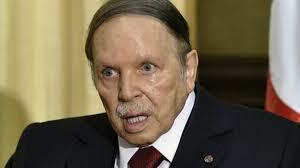 Bouteflika himself has not unveiled his intention yet. The nomination has not taken into account the President’s poor health condition. Bouteflika has made rare public appearance since 2013 after he suffered a mini-stroke that incapacitated his ability to walk and to speak. “Bouteflika is not able to continue to govern because of the nature of his illness,” the Islamist party said in a statement. “His candidacy for a fifth mandate is not in his interest, but in the interests of those who benefit from this situation,” the party added. The MSP was one time ally of Bouteflika’s FNL with which it formed a coalition until 2012. Over 100 presidential hopefuls including the MSP’s leader Abderrazak Makri have expressed their plans to enter the presidential race.